In the spirit of Throwback Thursday, today I wanted to share a recent purchase that was inspired by one of flywheel's affordable group breaks. He recently opened up a box of 1995 Sportflix and pulled a Mike Piazza/Carlos Delgado Double Take insert. I remember seeing these back in the day, so I immediately went over to COMC to see what other guys are in the set. 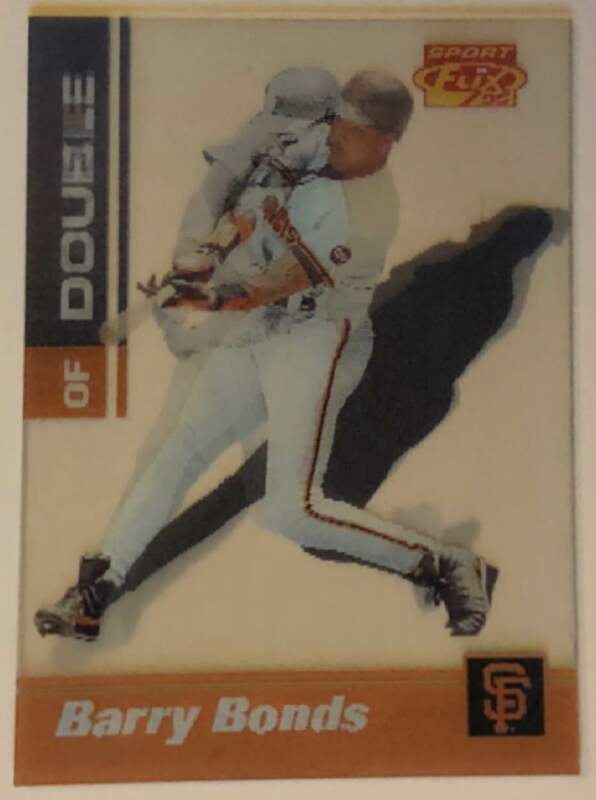 The set is loaded with stars from the 90's, but two cards really stood out to me. One featured Barry Bonds and Ken Griffey Jr. The other Tony Gwynn and Kirby Puckett. 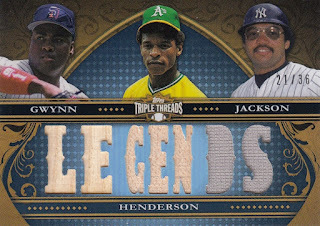 I love how Pinnacle had the foresight to pair up two of the greatest power hitters of all-time. By the time both of these guys hung up their cleats, they combined to hit 1,392 home runs and 3,832 runs batted in. 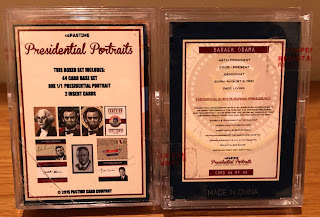 Five dollars might seem like a lot of money for a single insert and if this were your run of the mill 2019 Topps insert, I wouldn't argue with you. But this card (in my humble opinion) is ten times cooler than any insert I pulled out of my 2019 Topps blaster box. 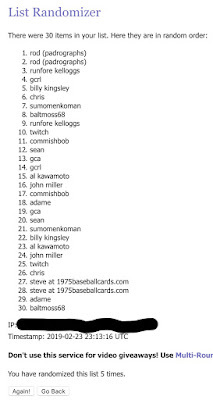 Topps has almost single handedly killed my interest in current inserts. 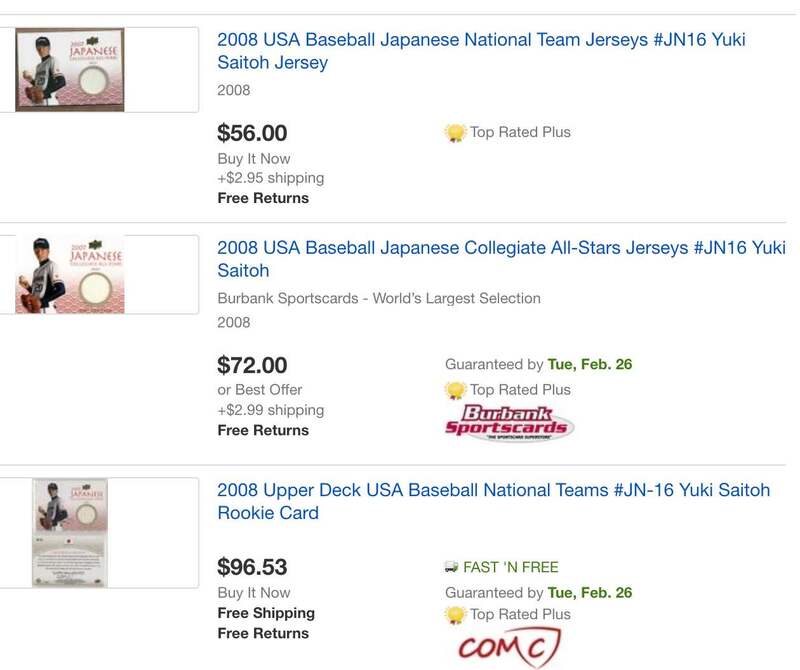 I'm tired of the same old rehashed, stale, overproduced inserts that Topps has been flooding the market with year in and year out for at least the past five to seven years. 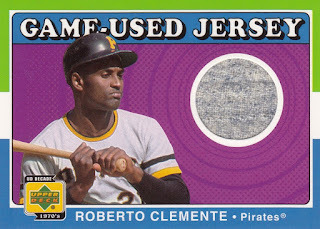 For being twenty-four years old, this see-through lenticular insert is a breath of fresh air. What are your thoughts on inserts produced these day? Love them? Middle of the road? Leave them? 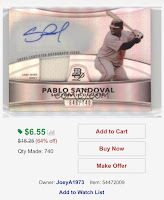 One of the cool things about purchasing cards from Check Out My Cards is collectors are able to download their purchase history and see exactly what they've spent on any purchase they've ever made. 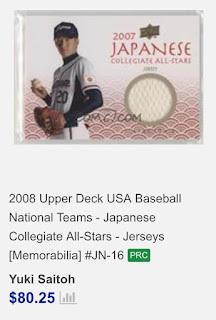 Two weeks ago, NPB Card Guy published a post that included a card from the 2008 Upper Deck USA Baseball box set that reminded me of a set I built when I first returned to the hobby. Based on the title of this post, you can probably figure out that I spent way too much for a jersey card of a guy I've never heard of. 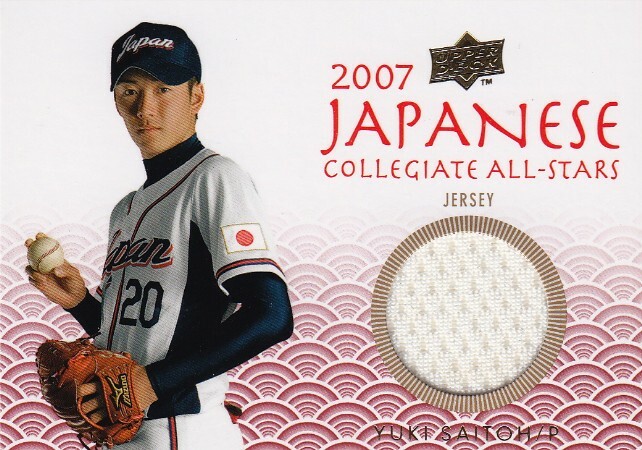 But Saitoh was quite the pitching phenom eleven years ago and the last card I needed for my set. According to NPB Card Guy, he became very popular after a 15 inning performance against Masahiro Tanaka that ended in a tie. I'll go ahead and assume that's the key reason I ended up paying $27.92 for this card. Seeing dealers ask insane prices for a memorabilia card of a guy with a career ERA of 4.32 in the NPB is mind boggling. Can't imagine anyone ever paying these prices. And it doesn't change the fact that it's one of my worst COMC purchases ever. There were at least two other Jennings autographs that I purchased on COMC back in the early 2010's. None of them have held their value. This is the one that has depreciated the most. 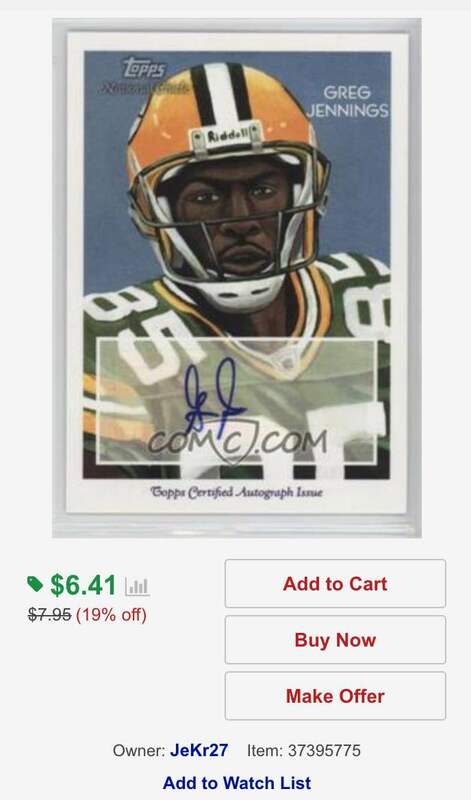 He's still ranks in the Top 10 in all-time Packers receptions, receiving yards, and touchdowns, but his signatures can be found for less than $5 on a regular basis. 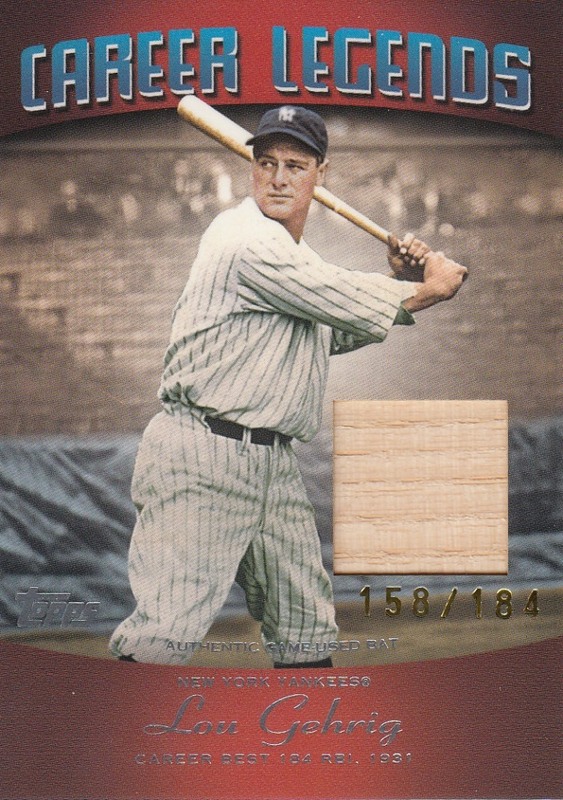 I purchased this card on 2/9/12, right before the 2012 MLB season. He had just wrapped up his first all-star season, had his 2nd 20+ home run season, and had a career .307 batting average. Bay Area fans, including myself had high expectations for Panda. Obviously he hasn't lived up to those expectations and his card values have plummeted. When it comes to buying cards of rising stars, football is not my forte. I thought Jeremy Maclin was going to be a super star. Yeah. That didn't happen. But his career wasn't nearly as bad as Ugh #4 and Ugh #5. Anyone else remember the Manning to Collie connection? 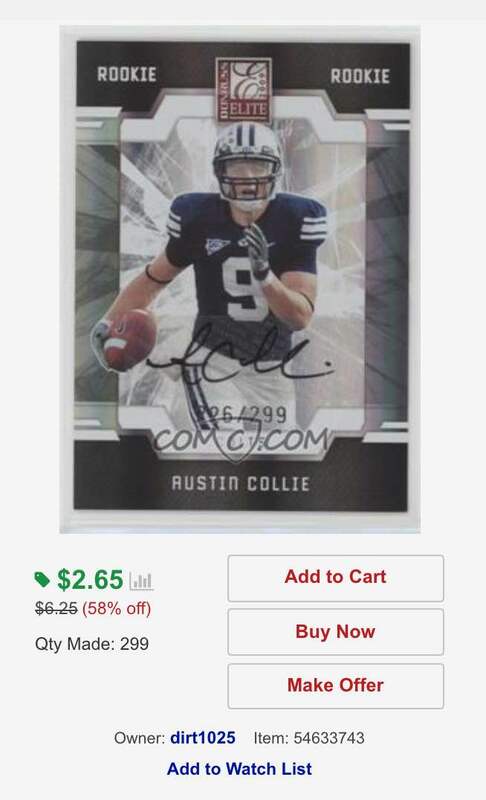 Sadly Manning moved on to Denver and Collie's career was hindered by injuries and that's why you can now pick up autographed rookie cards of him for a buck. 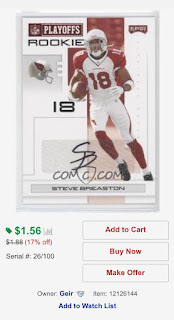 I'll wrap up this post about terrible COMC purchases with this Breaston. 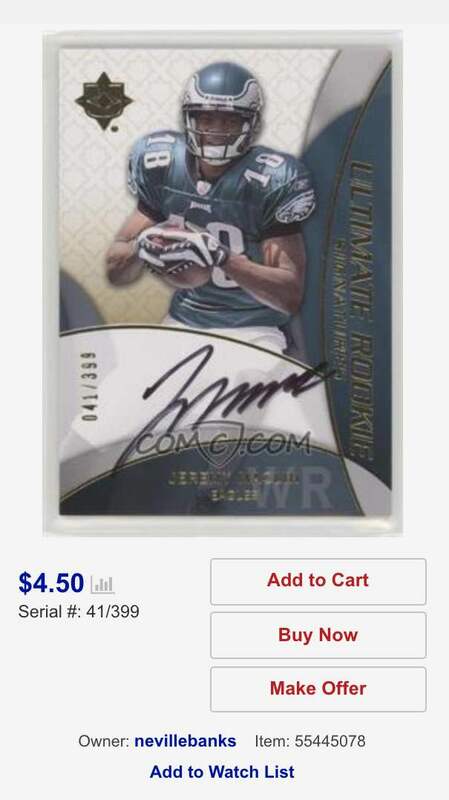 He's just another wide receiver who flamed out... and his card values went along with it. This little experiment of going back and analyzing what I paid was interesting and eye opening. 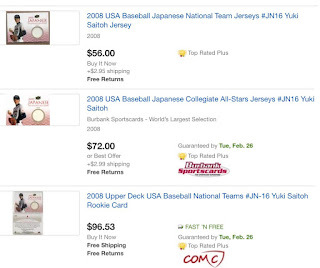 The good news is I tend to focus on hall of famers and great deals, so I'd say more than 75% of my COMC purchases have held their value. I'm planning on doing a few more posts relating to my COMC purchase history. Although none of them will be as depressing as this one. 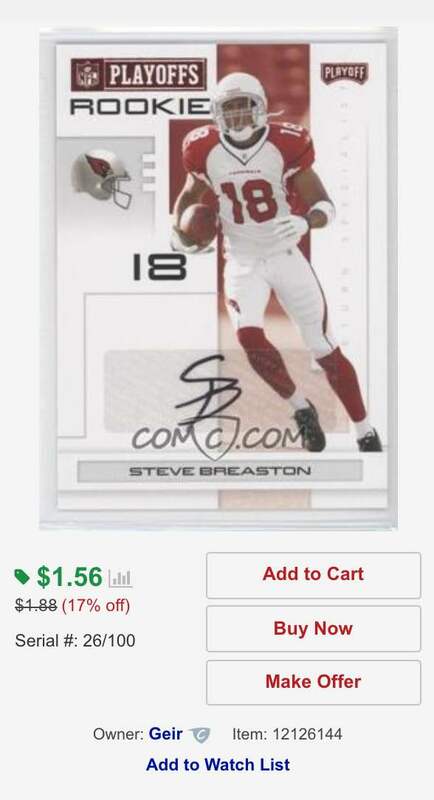 In regards to value, what are some of your worst sports card purchases? C'mon. Don't be shy. It feels good to get this kind of stuff off of your chest. During my last trip up to Oregon, I purchased a pouch of Long Ball Licorice and was so impressed that I went out and purchased three more pouches on their website. I waited a few weeks and the licorice hadn't arrived, so I contacted them through their website. A week later, I still hadn't received my licorice, nor had I heard back from anyone. I decided to reach out to the company through their Facebook page and immediately got a response. At first they had me confused with another customer, but after about two weeks of going back and forth, they finally informed me that they were sending me my package. After about six weeks, I finally received a package of three 3.5 oz. pouches of their raspberry flavored licorice. 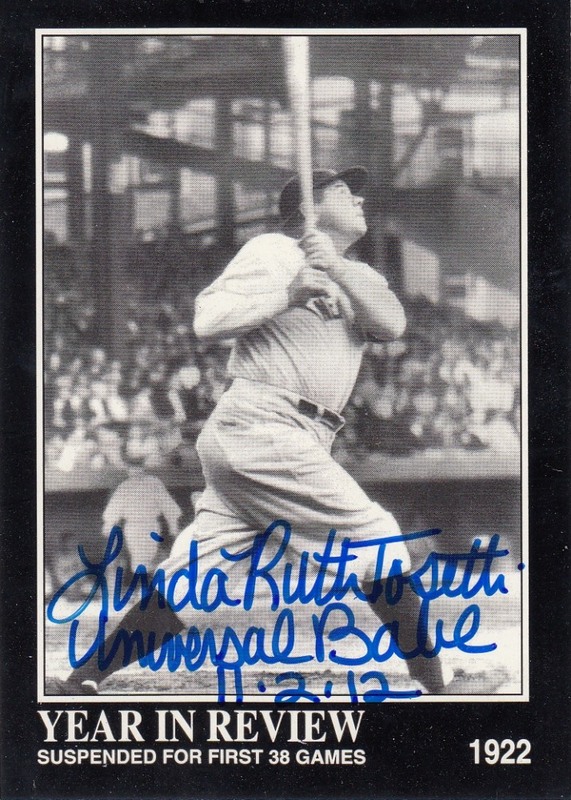 Babe Ruth passed away forty-plus years before this card was even produced, so this obviously isn't signed by the Sultan of Swat. 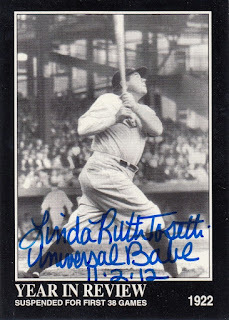 But it is signed by his granddaughter, which is a unique and a pretty cool addition to my baseball autograph collection. According to the customer service department at Longball Licorice, it has at least a $20 value. But realistically, you can't put a price on good customer service and that's what this autograph represents. Will I continue to buy licorice from this company? Heck yeah. I'm especially excited to try out their green apple licorice as soon as its available. 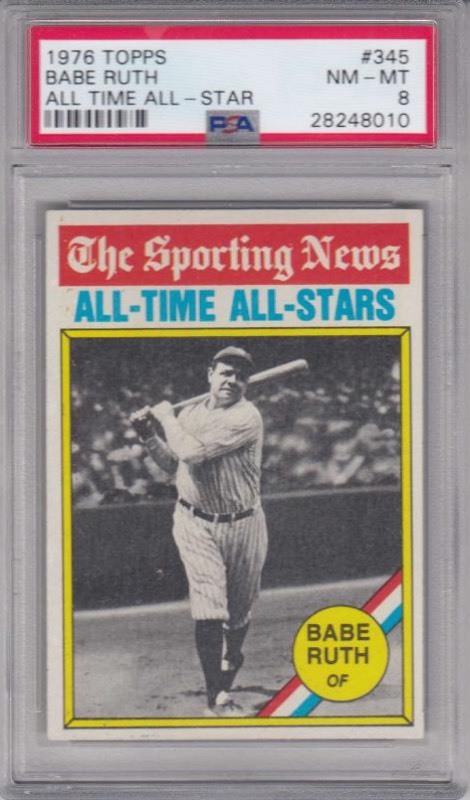 The 1976 Topps All-Time All-Stars subset is an affordable way for collectors to own great looking vintage cards of some of the greatest names in baseball history. 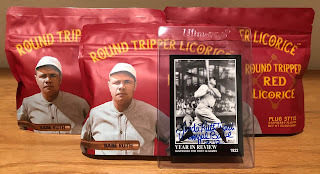 I picked this card up a year ago over at 4 Sharp Corners for $15.83, which is cheaper than what I paid for those three pouches of raspberry flavored licorice. Well that's it for today. My winter break is over and I'm heading back into the classroom this morning. Have a great week everyone! Sometimes it's better to learn something later, than to never learn about it at all. 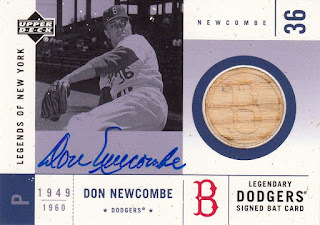 As a baseball fan for almost my entire life, I had heard Don Newcombe's name on numerous occasions. I knew that he was a black pitcher who played for the Brooklyn Dodgers, but it wasn't until I started doing research on my left-handed Cy Young Award Winners project that I discovered he was the first person to win the Cy Young Award in 1956. It's one of his first certified autographs and supposedly contains a piece of one of his game used bats. Newcombe was exceptional at the plate. Just ask Night Owl. That's where I discovered that he was one of the greatest hitting pitchers in the history of the game. In 1955, he had one of the greatest seasons at the plate for a pitcher in MLB history when he batted .359 with seven home runs in 125 plate appearances. Brian over at Highly Subjective and Completely Arbitrary mentioned in his tribute that Newcombe was used as a pinch hitter and we eventually converted into a first baseman after wrapping up his MLB career and crossing the Pacific to play in Japan. 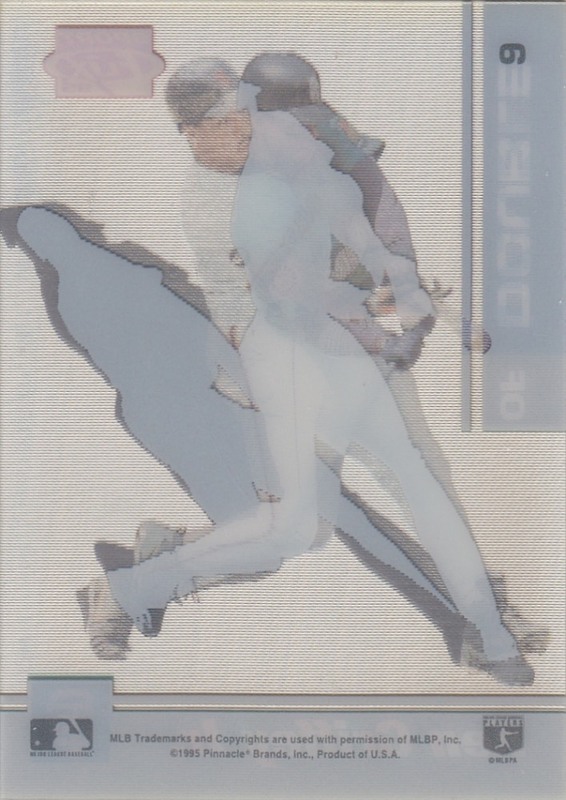 Sean's tribute over at Getting Back into Baseball Cards... in Japan confirmed that. 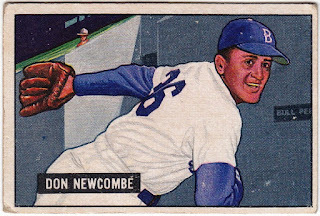 In fact, I've learned so many cool facts and stories about Newcombe this week. It's just unfortunate that I didn't appreciate him more while he was still with us. I guess my mind isn't what it used to be. 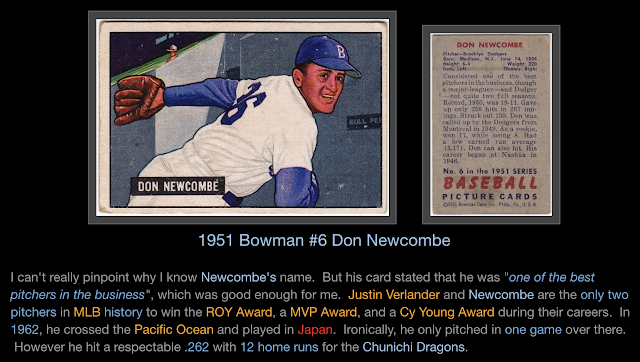 I appreciate all of the bloggers out there who wrote tributes to Newcombe and have given me a nice refresher course. Sure I'm a little embarrassed that I didn't remember this information, but this time I assure you that I've learned just how important Newcombe was to the game I fell in love with as a kid. And like the blog title states... it's better late, than never. 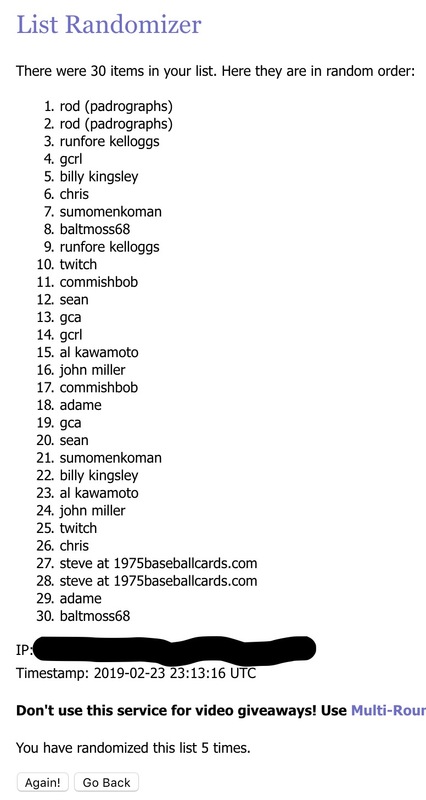 Thank you to all of those who participated in my first contest of the year. Eighteen different people left comments on my post. Three of those people weren't interested in the prize, which means that there were fifteen entries. Since I was going to pick the 16th person after 5 randomizations, I ended up needing to put everyone's name in twice. Congratulations John Miller! I'll package up your set and try to ship it out to you as soon as I can. Depending on the topic, choosing your favorites can be the easiest or hardest things to do. For example, choosing my favorite french fries is a no-brainer: McDonald's. Choosing my favorite burger? Not quite as simple. Favorite baseball team? Easy peasy lemon squeezy. The Oakland A's. Favorite football team? Not quite as simple. 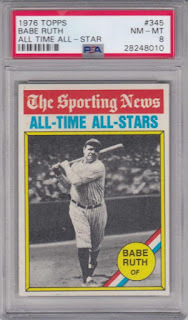 Favorite baseball card in the collection? Walk in the park. The 1956 Topps Jackie Robinson. Favorite relic card? Not quite as simple. That's precisely what J. Meeks is asking us to write about for the contest he's holding over on his blog: My Cardboard Habit. The prize is 150 Panini Points and a sweet looking patch card of Kyle Lewis. If you're interested in participating, please click on the link. Okay. Let's get back to the question at hand. 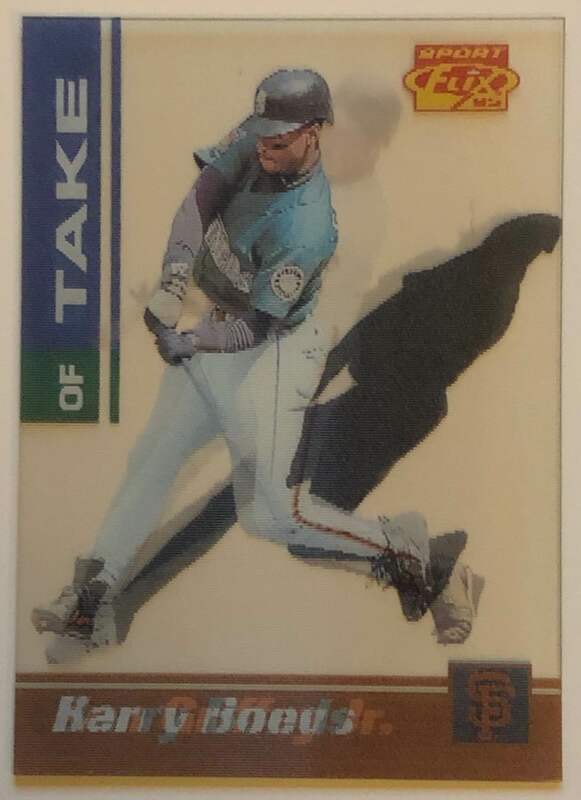 What is my favorite memorabilia card in my collection? Now before I answer this question, I narrowed down my search by focusing only on baseball cards. I also eliminated any autographed memorabilia cards from the running. 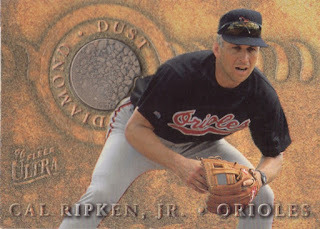 I'll kick things off with my favorite Ripken memorabilia card. 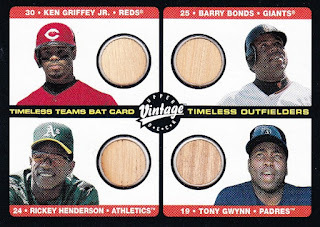 Upper Deck often gets credit for baseball's first memorabilia card with their 1997 Game Jerseys (see down below). 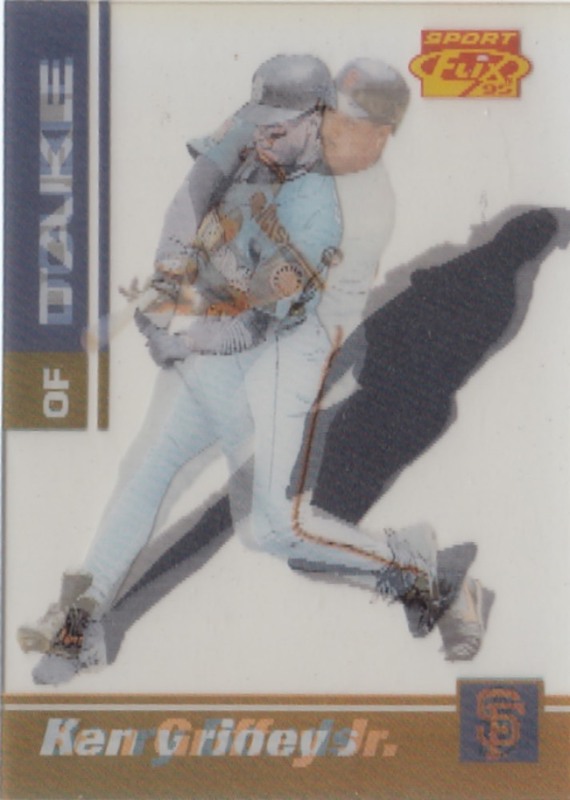 However technically Fleer beat them to the punch with this game used infield dirt card from Camden Yards. 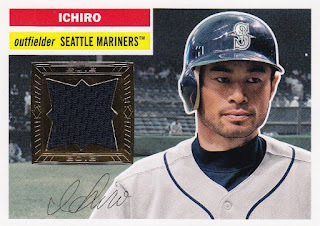 This card combines my love for the 1956 Topps baseball card design and my fanfare for Ichiro Suzuki. Kirk over at CaptKirk42s Trading Card Blog generously donated this card to my collection back in 2014. Most fans will never associate Maddux with the San Diego Padres... including me. That's because he only spent two of his twenty-three MLB seasons there. 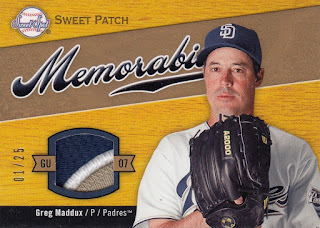 But that also means that he doesn't have a lot of Padres game used memorabilia cards. And out of all of the ones sitting in my collection, this is my favorite. 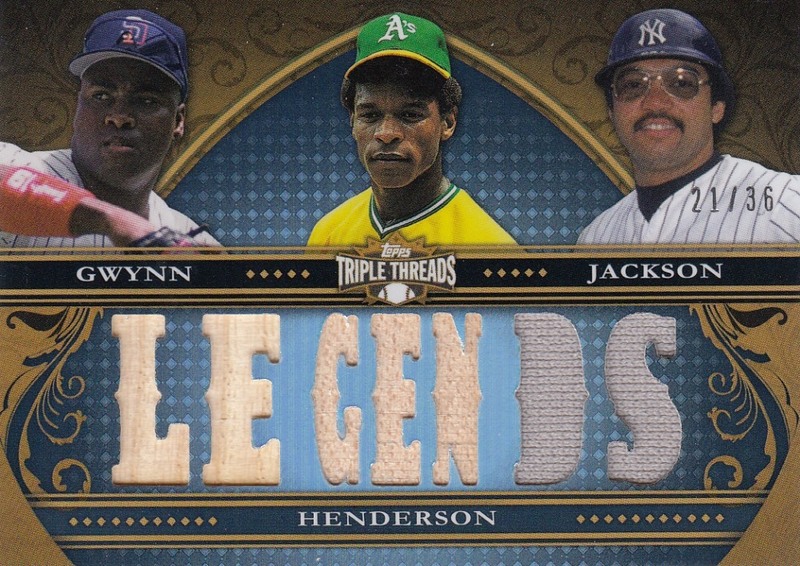 I love this card, because it combines my two favorite baseball players and some guy wearing Yankees pinstripes. Cutting up a game used bat might be considered an act of blasphemy among baseball purists and I can't really argue with them. If it were up to me, this card along with a few other cards on this list wouldn't exist. However Topps produced it and I was fortunate enough to get it in a group break I participated in last year. 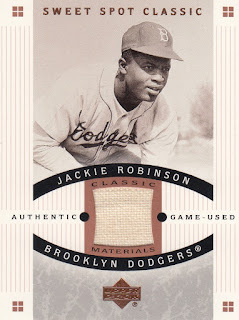 This card popped up a few weeks ago in my Jackie Robinson post. The simple card design is the primary reason this card is my favorite memorabilia card of #42. 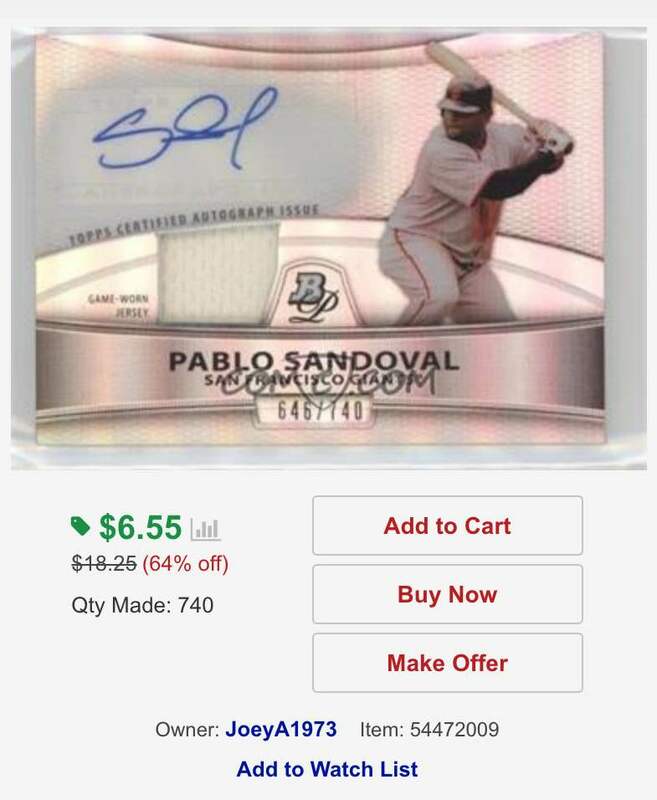 This card is a piece of cardboard history. 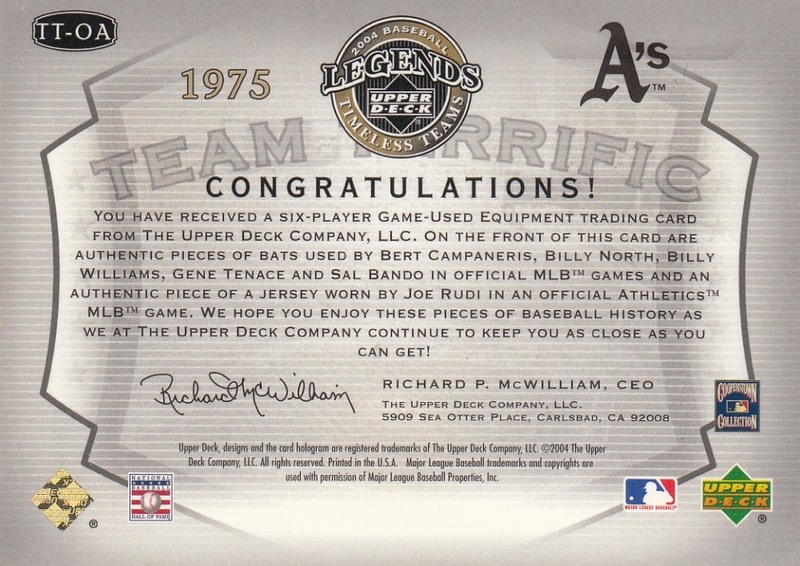 Back in 1997 Upper Deck made headlines when they produced baseball's first game used jersey cards. 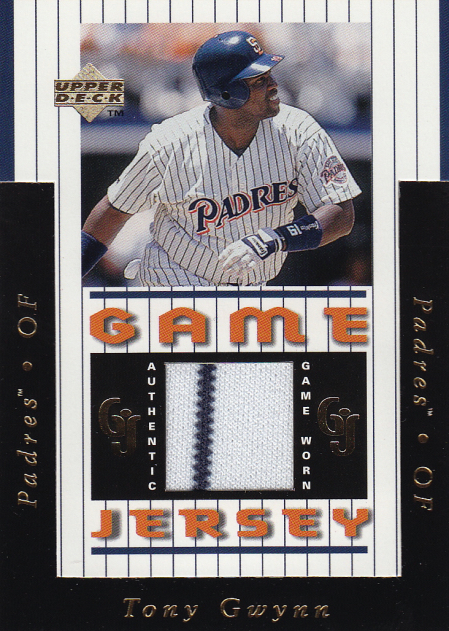 I know that the Griffey is the card everyone wants from this set, but to this Padres collector... I'm totally content with owning the Gwynn. 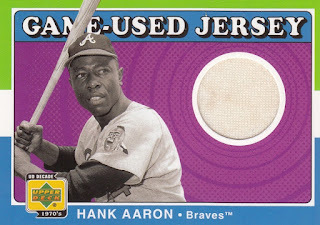 This is the only Hank Aaron jersey card sitting in my collection and it happens to be a part of one of my favorite memorabilia sets. I just love this card's design. I've actually thought about putting together this set since I have two of the biggest cards out of the way. See Runner Up #1. When I was originally thinking about J. Meek's question, this is the card that popped into my head. Not only does it feature my two favorite baseball players, it also includes two of the greatest hitters of my generation. What can I say? It's a Roberto Clemente jersey card. But more than that... it's actually part of a set that features a design I love. I went back and forth a few times before finally settling on my official response to J. Meek's question. Campy, North, Williams, Rudi, Tenace, and Bando trump Clemente. Well at least to me. 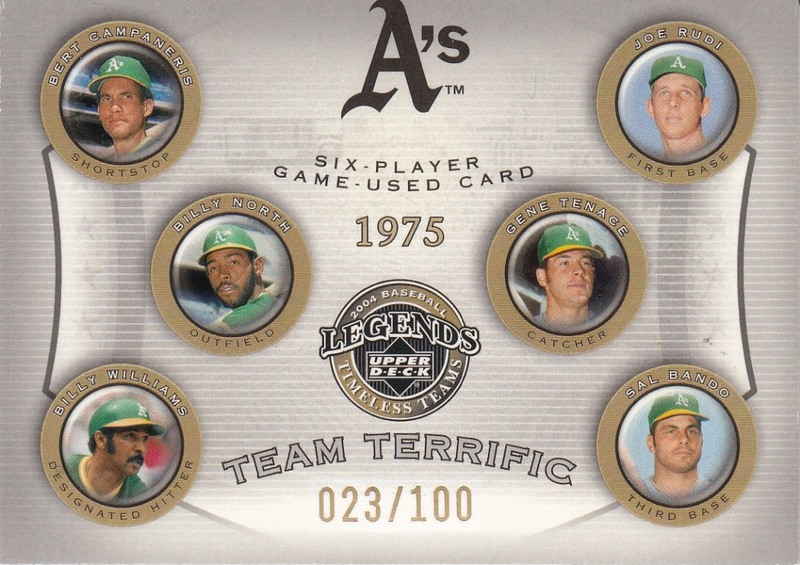 This card obviously received bonus points, because I'm a huge A's fan. But it also received some sentimental points, because this was a generous gift from Jim over at Cards As I See Them and Timeless Teams. Well there you have it. One of the most difficult decisions I've had to make in at least the past week or so. 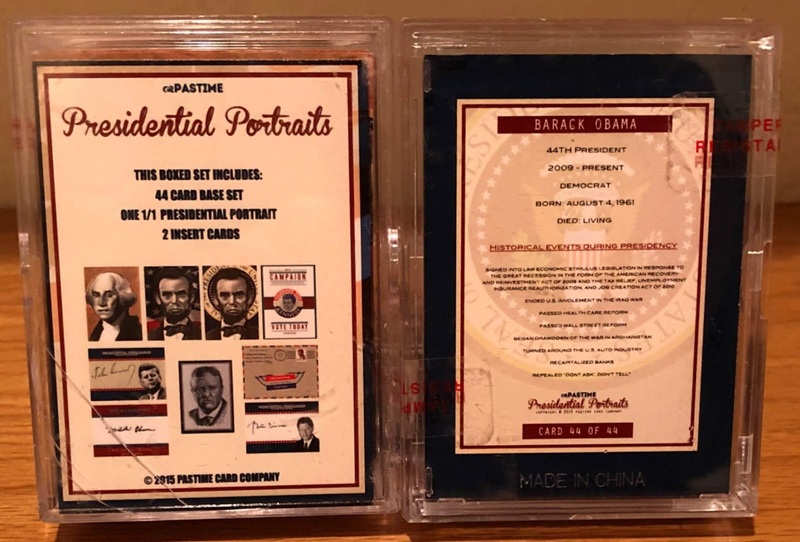 If you have a favorite memorabilia card and would like to enter J. Meek's contest, then click here. Speaking of contests... I'm holding one of my own. All you need to do is click here and answer one of my questions.